The NWBHL All-Star game was held Sunday, January 27th. The format was as follows: Three 20 minute periods with the middle period consisting of two 10 minute halves at which point we did our goalie switch. The teams were divided down the middle with the Giants, Bullies, Barons, Wolverines, Jaguars, Spartans, and Rage playing together against the Executioners, Thrashers, Wolfpac, Crooks, Warhawks, and Stingrays. NWBHL President, Jeff Brailsford, presents a shiny new ball cap to game MVP, Floyd Jewell Team Orange, at one point trailing by four goals, would stage an impressive comeback to down Team Grey by a score of 11 - 9, with an empty-netter, in an All-Star game that will go down as an absolute classic. Despite the large amount of goals scored, the goalies were one of the main stories as there were repeated robberies of the jaw-dropping variety. Several players showed why they earned their All-Star status as they dominated play and there were more than a few big stat nights. Harp Kalkat picked two goals and three assists for Team Orange while Brenden Ham and Mike Sanghara did a bulk of the damage for Team Grey with 3-1-4, and 2-2-4 respectively. 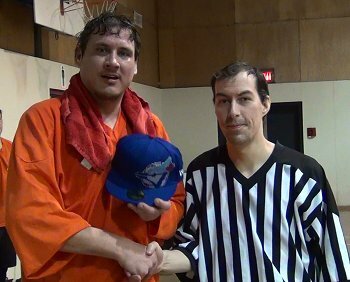 In the end the All-Star MVP would go to Floyd Jewell who finished of the event by scoring the final three goals for Team Orange in the victory.